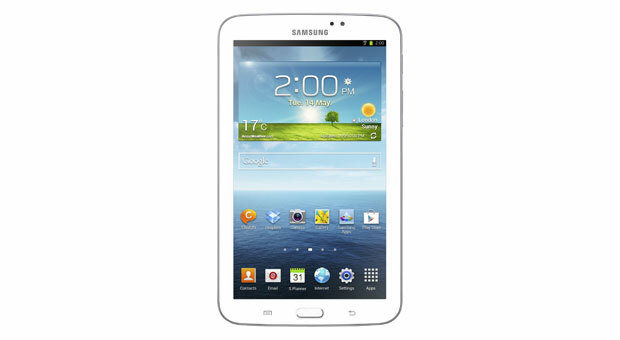 Samsung announced the third generation of its Galaxy Tab series of tablets, and guess what? they're all designed similarly to the Galaxy S4. The Galaxy Tab 3 7.0, 8.0 and 10.1 are all clearly budget tablets that don't carry any impressive specs. Since the Galaxy Tab 2 series also showed the same low-end trend, I believe Samsung intends to keep the Galaxy Tab line as a budget-conscious one. The Galaxy Tab 3 7.0 is expected to hit shelves later this year, and will be available in Wi-Fi only and 3G versions. The price for the Wi-|Fi only version with a poor 8GB of expandable storage is $199. Honestly, I can't think of any reason why someone would buy this tablet instead of the equally priced, albeit much better specced Nexus 7. The Galaxy Tab 3 8.0 is considerably better specced than the Tab 3 7.0, with a $299 price tag. Of course, the design, like the Tab 3 7.0, is very similar to the Galaxy S4. The difference between the Tab 3 7.0 and 8.0 is the 8.0 has much thinner lateral bezels to accommodate the larger display, which, by the way, is much more acceptable than the Tab 3 7.0. This 8" display has a higher resolution of 1280 x 800, which results in a 189 pixel density, which is not bad. The TFT display doesn't sound like it'll boast particularly vibrant colors or wide viewing angles, though. The Tab 3 8.0 is considerably thinner than the Tab 3 7.0 (7.4mm vs 9.9mm), practically as thin as the iPad mini, and is also very light for its size, weighing 314g. This tablet is equipped with two cameras: a rear 5MP camera, with an LED flash and capable of shooting 720p video, and a 1.3MP front-facing camera. The Tab 3 8.0 brings back from the dead the old Exynos 4212 SoC (its only other appearance was in the original Galaxy Note), which is a 45nm based SoC containing two Cortex A9 cores at a slightly higher 1.5GHz clock and (naturally) a Mali-400MP GPU and an unusual 1.5 GB of RAM memory. The battery is slightly larger than the one used in the Tab 3 7.0, being a 4450 mAh unit. The Galaxy Tab 3 8.0 is expected to debut at the same time as its 7-inch sibling in Q3, the 16 GB version shipping for a $299. It puts this tablet in a good position, as it is comparable to the iPad mini, yet $30 cheaper. Finally, there's the 10-inch Galaxy Tab 3. This tablet actually distinguishes itself from most Android tablets because it uses Samsung's usual hardware home button and the two capacitive buttons, hence there are no onscreen buttons displayed, which gives the display a cleaner look, and also allows for more screen real estate to be used. This could be a selling point for this tablet. The Tab 3 10.1, unlike its smaller counterparts, is tailored for use in landscape mode, so its designed Galaxy S4 style, only in landscape. made of the same glossy white plastic, the Tab 10.1 is very thin for its size, measuring 8mm, and it's also extremely light, weighing 510 grams. So this tablet is 1.4mm thinner and an impressive 140g lighter than the latest iPad. However, such a minimalist design comes at a price, for instance, the lackluster display. I mean, 1280 x 800 pixels in a 10.1 inch screen (149ppi) is just far too low for today's standards. Even ASUS' $299 budget tablet has a 1920 x 1200 display. At any rate, in my opinion this is a great deal-breaker for this tablet. The trend has been that OEMs are realizing that tablets aren't good for taking photos, so some latest 10-inchers haven't put any emphasis on their cameras, and this is apparent with the Tab 3 10.1, as its rear facing camera is of 3.15MP with 720p video, and the front-facing camera is a standard 1.3MP. Internally, the Tab 3 10.1 consists of a 6800 mAh battery, which should be well suited for its specs, and in a weird move, Samsung ditched its own Exynos SoCs in favor of an Intel Atom Z2560 SoC, a 32nm based SoC with a dual-core Saltwell CPU (four threads thanks to HT) at 1.6GHz. A PowerVR SGX 544MP2 should offer very good gaming performance, especially with the low resolution of the tablet. The GPU's base clock is of 400MHz, which for this GPU should offer performance somewhere between the iPad 2 and 3 (but because of the lower resolution it could be actually in between the iPad 3 and 4). So this tablet won't win any benchmarks, but it's enough for a decent experience. The Tab 3 10.1 will ship with 1 GB of RAM (less than the Tab 3 8.0, how strange....). The Galaxy Tab 3 10.1 should debut around Q3, like the rest of the Galaxy Tab 3 line, and it will be available in Q3. It will sell in Wi-Fi only, 3G, and LTE versions, with the 16 GB Wi-Fi only entry level Galaxy Tab 3 10.1 costing $399. Personally, I think Samsung's pricing is pretty bad here, because for $100 less you can get an ASUS tablet with a Full HD display, and for the same price you can get a top end Nexus 10. So, again, I don't see any reason to buy this tablet when there are better specced competitors for the same or even a lower price.